The Yield Exclusion (YE) allows specific years to be dropped from the calculation of guarantee yields for crop insurance. This option is available because of provisions contained in the 2014 Farm Bill. This article describes YE, provides an example of Actual Production History (APH) yield calculation and premium quotation under YE, and provides guidance for YE’s use. As a practical matter, most farmers should take YE when it is available and raises the guarantee yield, as long as it does not impact their trend adjustment eligibility. The same material is covered in a YouTube video available here. What is the Yield Exclusion? Each county may have specific years that can be excluded from the APH yield calculation. To be excluded, the county or its contiguous counties has to have a yield for a year below 50% of the average of the previous 10-years of county yields. The determination of county-year combinations eligible for exclusion is done by the Risk Management Agency (RMA) and made available in their actuarial documents. Information and maps from RMA are available here. 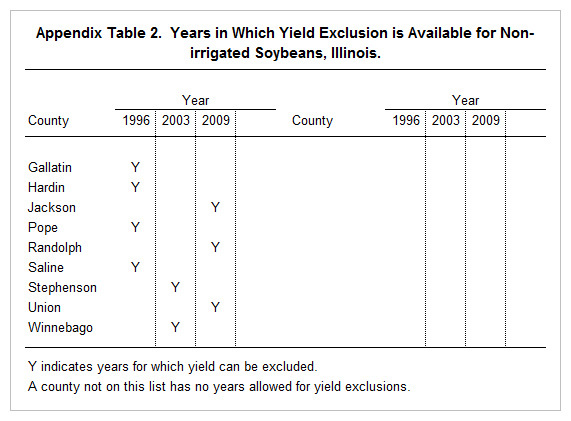 For soybeans, yield exclusions exist for a limited number of counties in southern Illinois (see Appendix Table 2). Table 1 shows an example of calculating Trend-Adjusted APH (TA-APH) yields without and with YE. In many cases, the TA-APH yield is the guarantee yield that is used to establish guarantees. This example is in McLean County and has actual yields for 2005 through 2014. When all years are included, APH yield for all years is 176 bushels per acre and TA-APH yield is 186 bushels per acre. The yield exclusion can be taken for 2012. 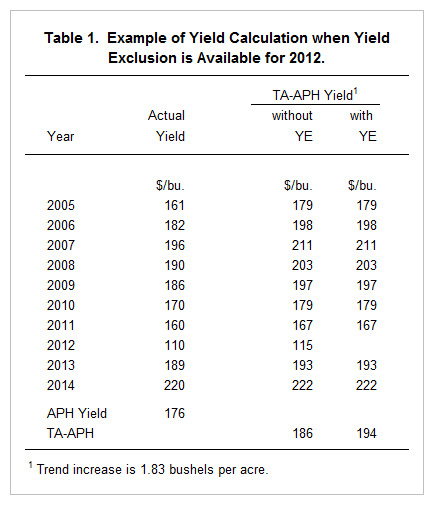 Excluding the 2012 yield raises the TA-APH yield to 194 bushels per acre. This producer will likely take advantage of YE because an increase in the TA-APH yield occurs under YE. Premium quotes for YE can be obtained from the 2015 Crop Insurance Decision Tool, as is illustrated for the above McLean County example. Without YE, the APH yield and rate yield equal 176 bushel per acre, and the TA-APH yield is 186 bushels. Figure 2 shows a premium quote without YE. With YE, the rate yield and the APH yield is 176 bushels and the TA-APH yield is 194 bushels per acre. Figure 3 shows premium under YE. Farmers will generally find it to their advantage to take YE when the TA-APH yield increases. Taking YE does not change the total premium for the same guarantee level. 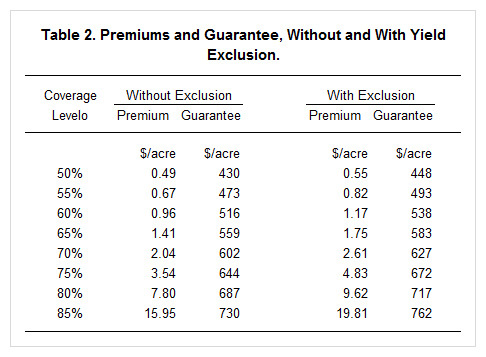 If $730 per acre is the guarantee with and without YE, both alternatives will have the same total premium. However, the farmer-paid premium can be lower because subsidy levels often are higher for lower coverage levels. Because a lower coverage level results in a higher guarantee under YE, YE farmer-paid premium quotes can be lower than non-YE quotes for the same coverage level. 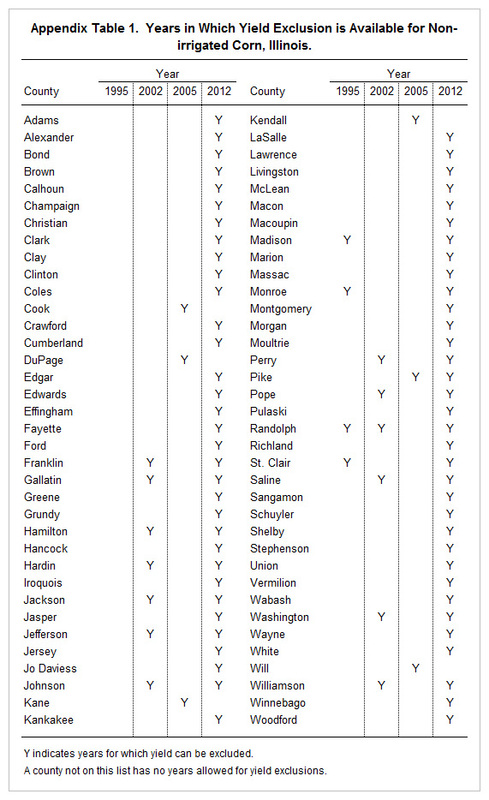 Table 2 shows premiums and guarantees with and without YE for the McLean County example quoted above. Consider an 80% quote and note that without YE, RP at 80% coverage level has a $7.80 farmer-paid premium and a $687 guarantee. With YE, an 80% coverage level has a higher premium at $9.62 per acre, but a guarantee that is $30 per acre higher at $717 per acre. If the producer wants to maintain roughly a $687 guarantee (80% coverage level without YE), the coverage level can be dropped to 75% with YE, resulting in a $4.82 per acre farmer-paid premium. Given that YE increases approved yield, it is difficult to build a case where taking YE places a farmer at a disadvantage unless it affects their eligibility for the trend adjusted yield endorsement, in which case the guarantee yield is lowered and becomes the APH yield. RMA has a factsheet on YE released in December available here. An overview of premium rating produced by RMA is available here. IFES 2014: Do Risk Management Decisions Change?